Editor's note: From the typewriter to the propelling pencil to our favorite, the world wide web, inventors and innovators from the United Kingdom have brought us brilliant advances that have changed the way we work all around the world. Over the next few weeks, we’ll share a handful of stories from disrupters and trailblazers in the UK who are using Google Apps for Work to support their mission while growing at faster and faster speeds. Today we hear from Rytis Vitkauskas, co-founder and CEO of YPlan, a mobile app that lets users discover amazing experiences they can do that same night. For many, planning a night out on the town means grabbing the local weekly newspaper and thumbing through it to find entertainment and club listings. My co-founder Viktoras Jucikas and I think there’s a better way to plan an exciting night out with our mobile app. YPlan provides curated entertainment listings for London, Edinburgh, New York, San Francisco and Las Vegas, and gives our users the ability to easily buy tickets with two taps on a smartphone. The app has surpassed one million downloads to date and our company has swelled to 60 employees. Growing rapidly, we’ve learned some valuable lessons. The following are five insights that might help business leaders stay focused and keep momentum when growing their business. YPlan started as a solution to solve a personal problem. My co-founder Viktoras and I previously worked in finance but quit our jobs to travel to San Francisco to find inspiration. In San Francisco, we found it challenging to easily find things to do on our free nights. There wasn’t a central destination to find events and book tickets. So we decided to create an app to solve that problem. 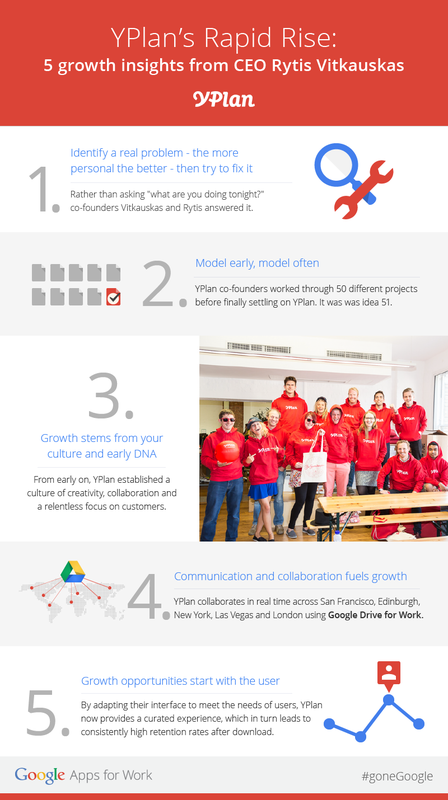 In the early stages of our business idea, we came up with 50 different project ideas before finally settling on YPlan. We constructed a business model, subjected it to an intense process of testing, then eventually scrapped it and started over. When we returned back to London we started the concept for YPlan. We conducted user testing that included Viktoras and I running around to make sure people had their tickets on time (we hadn’t finished the e-ticket mechanism by that point). Testing heavily during the first few months highlights problems you might not have anticipated and gives you the opportunity adapt your product accordingly. From early on, we established a culture of creativity, collaboration and a relentless focus on our customers, which has been a foundation for our future growth. From the first day we stopped negative office patterns of blaming and arguing, and instilled frequent communication, positive reinforcement and team problem-solving. Our primary focus is to deliver the best experience for our users and our employees tackle that task creatively on a daily basis. 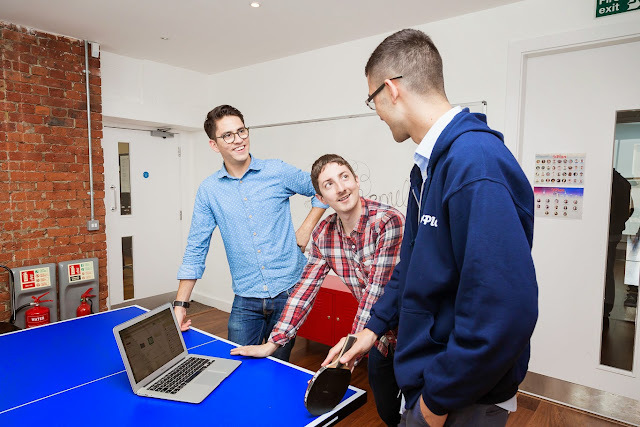 YPlan’s success is largely due to successful collaboration and integration with our partners. With our teams working in at least three time zones simultaneously, Google Drive allows us to collaborate globally in real-time. It’s our central communication hub for content sharing and project collaboration. Having files accessible from anywhere on a mobile device is big plus. This has enabled seamless working and communication with our local teams, which has directly affected our global success and allowed us to expand. When surveying growth options, look to your users and learn from that data. We’re constantly analysing the data we have on our existing users to see how we can improve our services. At any one time we have two thousand versions of the app running in parallel, undergoing a highly selective process of A/B testing, which means the app is constantly being refined. Closely studying our user data led to us introducing “collections.” We knew people wanted to choose from a wide variety of events, but had to present numerous selections in a way that wasn’t a boring list of options. By adapting our interface to meet the needs of users, we now provide a curated experience, which in turn leads to consistently high retention rates after download.